The Congressional Fire Services Institute (CFSI) and the International Fire Service Training Association at Fire Protection Publications, Oklahoma State University (IFSTA/FPP/OSU) are accepting nominations for the 2017 Dr. Anne W. Phillips Award for Leadership in Fire Safety Education. The award recognizes individuals for outstanding achievement in public fire safety education. The Congressional Fire Services Institute (CFSI) is accepting nominations for the CFSI/Motorola Solutions Mason Lankford Fire Service Leadership Award. Sponsored jointly by CFSI and Motorola Solutions, the award recognizes individual leadership in advancing fire and life safety initiatives. The Congressional Fire Services Institute (CFSI) is proud to announce that Congressman Bill Pascrell, Jr. (NJ-9) has been selected as the 2016 CFSI Legislator of the Year. On Wednesday, September 28th, the leadership of the Congressional Fire Services Caucus presented the National Fallen Firefighters Foundation with 112 American flags that have been flown over the United States Capitol Building. 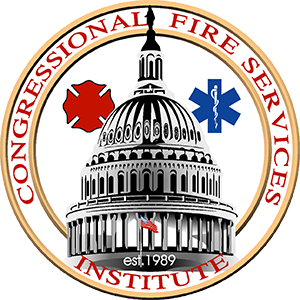 The Congressional Fire Services Institute (CFSI) is announcing an official Call for Proposals for the 2017 National Fire and Emergency Services Symposium. The Symposium will be held in Washington, DC on Wednesday, April 5, 2017, the day before the 29th Annual National Fire and Emergency Services Dinner. Today, we will be highlighting our corporate partner: Fire and Emergency Manufacturers and Services Association. The United States Department of Justice recently announced that it is accepting nominations for the 2015-2016 Public Safety Officer Medal of Valor, the highest national award for valor by a public safety officer. Each year, recipients are honored at a special White House ceremony in which the President or Vice President presents the medals.